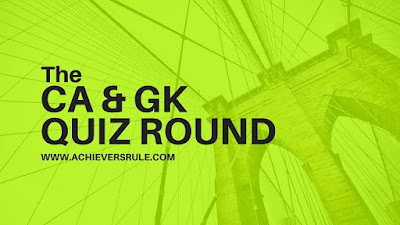 Daily Current Affairs Quiz for 5th May 2018 consists of a list of 15 questions along with proper explanation given for each of the questions which are very important for the upcoming examinations of IBPS PO, IBPS CLERK, SSC CGL, SSC CHSL and other similar examinations. Before attempting these aspirants can go through the Daily Current Affairs Updates of 5th May 2018 to have a better idea of the subject. Q3. who is the new chairman of the Insurance Regulatory and Development Authority of India? Former IAS officer Subhash Chandra Khuntia is the new chairman of the Insurance Regulatory and Development Authority of India (IRDAI). Q4. Who has been appointed as the acting chief justice of Punjab and Haryana HC ? Q5. Who has been appointed as full-time member of Finance Commission? Q6. who is the additional (independent) director of ICICI Bank? ICICI Bank said its board has appointed Radhakrishnan Nair as an additional (independent) director of the bank for five years. Q7. What is India's rank according to the FDI Confidence Index 2018? Q9. Pakistan has reopened Major Trade Route With which country? Q10. which app provides details of deposited pension? Mobile app Umang, a one-stop solution for many government services, is now offering details of your deposited pension, according to EPFO or Employees' Provident Fund Organisation. Q11. State-run Power Grid Corporation of India (PGCIL) has inked a pact with the ministry of power to incur capital expenditure of __________ for the current fiscal. State-run Power Grid Corporation of India (PGCIL) has inked a pact with the ministry of power to incur capital expenditure of Rs 25,000 crore for the current fiscal. IT firm Cognizant has acquired privately-held Hedera Consulting, a move that will strengthen the former’s consulting and digital transformation capabilities for clients in Belgium and the Netherlands. The 4th Regional Conference on ‘Futuristic, Resilient and Digital Infrastructure’ concludes in Bengaluru . Q15. Who has been conferred with the WBC Asia Boxer of the Year? Indian Neeraj Goyat has been conferred with the WBC Asia Boxer of the Year Award. Neeraj is the current WBC Asia champion in welter weight category.